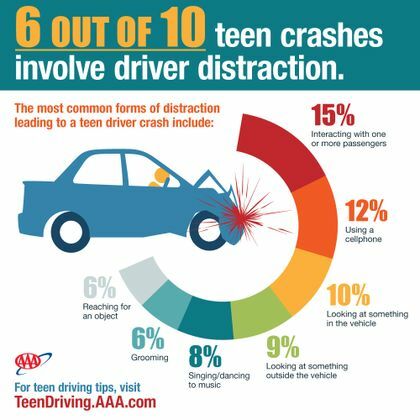 The most comprehensive research ever conducted into crash videos of teen drivers has found significant evidence that distracted driving is likely much more serious a problem than previously known, according to the AAA Foundation for Traffic Safety. The unprecedented video analysis finds that distraction was a factor in nearly 6 out of 10 moderate-to-severe teen crashes, which is four times as many as official estimates based on police reports. Graduated driver licensing (GDL) laws allow new drivers to gain practical experience in a relatively safe environment by restricting their exposure to risky situations. Thirty-three states, including Maine, New Hampshire and Vermont have laws that prevent cell phone use for teens and 18 states have passenger restrictions meeting AAA’s recommendations.